In a former lifetime, I was studying to be a CGA (Certified General Accountant). I was working full-time at a public practice firm and doing my courses evenings and weekends. I lived and breathed numbers. As you can see, I am no longer in that field of work for a few different reasons, but I do remember how much being organized made a difference in my work output. As with many office jobs, paper is everywhere. In my old career, there was always paper flying around and usually sticky notes saying what had to be done with that particular piece of paper. I used to put the paper in piles on my shelves. However, that made for lots of wasted space. I wish I would have had the Pendaflex back then. It would have been a dream! So accountants out there- this is the perfect product to help you manage your paper piles. I know you know what I am talking about! Even with my blog, I tend to pile up the paper. Normally its paper that goes with products or information sent to me from PR and I didn’t really have an effective system for managing it until now. Manage your paper before it manages you! Cheesy I know but I am serious. Paper clutter CAN and WILL get out of hand. I received three products to try out in my home office: PileSmart Desktop Organizer Tray, PileSmart Binder Label Clips, and PileSmart View Folders with Write On Tabs. The PileSmart Desktop Organzier Tray actually won the Organizer’s Choice Award for Best Business Product in 2007 and I can see why. Whoever thought of this was genuis! 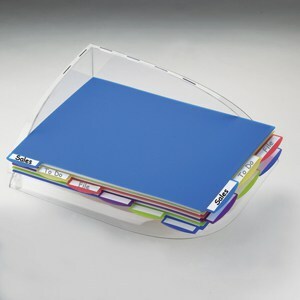 Its made of a clear durable acrylic and contains six coloured dividers with labels so you can differentiate between your different piles of paper. I like that the dividers are very strong and sturdy so all the papers won’t just flop out as you lift to get a piece. Its also a little bit slanted to keep the papers neat and tidy in the tray. I have started using mine for my blog reviews and filing the various papers I receive in the categories. I have a categories for the various events I have planned, review products, review & giveaway products, book reviews, etc. The PileSmart Binder Label Clips are to keep together loose paper or receipts so you can easily find them and no what they are right away. I like that they are all different colours so finding what you need in a jiff is so much faster. Â They are designed to hold 1/2 ” thick of paper together (works out to about 100 papers). They also come in 1/4 ” thick size. I have been using mine for my receipts- my monthly household budget as well as my business expenses. 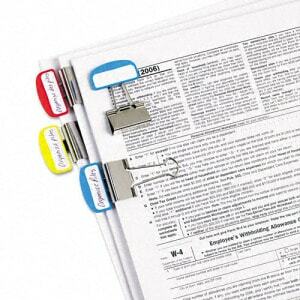 It makes filing easy and fun. When tax time comes, I am going to be able to get it done so fast! No more shoebox of receipts here. 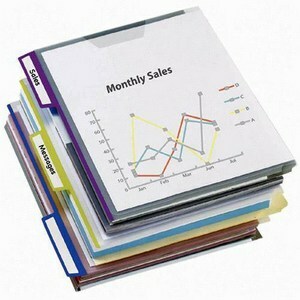 The PileSmart View Folders with Write-On Tabs are poly folders that you can write on your label. They come in a package of 6 and are multicoloured- mine were purple, lime green and royal blue. The different tab positions are great so you can lay them on top of each other and still be able to see the labels clearly. They hold up to 75 sheets of paper and fit in hanging folders and also have a textured surface to prevent the piles from slipping all over the place. They are great to use in your household budgeting or in an office. Any of these three products would have made my day a little easier in my old accounting job. You can buy all three products online at Amazon. Check out their blog, Facebook and Twitter pages. Plus there is a free downloadable guide to desktop organization. Make sure to visit Amazon and check out these fabulous organizational products from Pendaflex. This former accountant gives them a thumbs up! I received the review product and a $20 Target Gift Card. This is my honest opinion and was not influenced in any way. Oh I could So use those PileSmart Binder Label Clips! I use the clips without the tabs all the time and the labels would make my life so much easier. Thanks for posting about them. Goodbye, headed to Amazon! Following you back. Thanks for stopping in to my blog.